The Performix ION pre workout supplement is one of the new generation of pre workout products and is rapidly gaining popularity among both new and experienced pre workout users. While not exactly the new kid on the block, it is still relatively new to most people, and many have never heard of it. Much like Jack3D and Craze, this pre workout supplement is quite strong. It is one of the more expensive products on the market, but considering the strength of it many people will be more than satisfied with the energy half a serving gives them. If you are only taking half a serve at a time it then becomes very economical, as a 45 serve container is now 90 serves. You can do the math here. However if you are a seasoned pre workout user then you will love that you may only need 1 serve to give you the effects that you possibly needed 2 serves of other products to achieve. 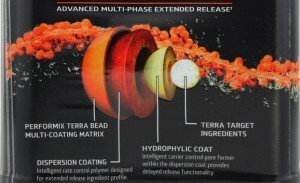 In my mind the greatest feature and unique to this product are the “Performance Terra Intelligent Dosing Beadlets”. This is why they call it multi-phase. I liken these little beads to slow release fertilizer. If you’ve done any gardening you will know those little balls that come in many potting mixes that slowly let out extra nutrients over time. In much the same way but in a shorter cycle (think minutes and hours rather than days and weeks) these beads prolong the effects of this pre workout and help you work out longer. Many people report this product to last them 3-4 hours, as opposed to much shorter times with other products. For me, I would say every other pre workout supplement I’ve used (and I’ve used so many I’ve lost count) last from anywhere between 30 minutes to at most 2 hours. Some people would say these beads are a gimmick and in a way they are. However they are a very effective gimmick and I think this type of delayed release mechanism will revolutionize pre workout supplements. I expect to see similar technology appearing in other products very soon. At first it was a bit weird having the undissolved beadlets in the cup when drinking it, but I guess I just have a negative association there from past experiences with other products that have not fully dissolved. After a couple of times it didn’t bother me at all. One other thing I need to comment on before getting into the review is the claim on the front of the package of 3 patented ingredients This is true but I think it is a bit misleading. There are indeed 3 patented ingredients in this formula however none of them are patented by Performix, and these 3 ingredients (Carnosyn, Advantra Z and Bioperine) are commonly found in other pre workout supplements. That is not to say that this is not a selling point and these ingredients definitely help to make this a high quality product however that is something that caught my eye. This will be dicussed in greater detail in the ingredients section of the review below anyhow. The first things we see on the ingredient list are Niacin (vitamin B3), vitamin B12 and Calcium. B group vitamins are important to support the bodys metabolic and anabolic processes such as protein synthesis and the metabolism of various sources of energy (carbs, protein, fats etc). For this reason you will find a B group vitamin complex in most products. I would have expected to see vitamin B6 in there as well but B3 and B12 are the main ones. It is nice to see the calcium there as well – this is an important component that many products overlook. The main function of calcium in a product such as this is to raise the pH level in the stomach (make it more alkaline) and subsequently the body. There are many quite acidic substances in pre workout supplements so it is important to try and balance the pH. The science is complicated but basically a higher pH means that more of the active ingredients can be absorbed into the bloodstream and the performance of muscles can be increased. Low pH is the enemy of body builders as it is known to reduce muscle mass in pigs and this is also believed to be true for humans. As is the case more often not with pre workout products, the active ingredients are contained within a ‘proprietary blend’ so the actual amounts of each are not disclosed. I find this incredibly frustrating however even though exact quantities are not known we can still infer some things based on the order the ingredients are listed in and the total amount. FDA Labelling regulations dictate that the ingredients must be listed in ‘descending order of predominance by weight’ which means the first ingredient listed weighs the most and the last ingredient weighs the least. Also, considering the total amount per serve is 3714mg and based on what we know about effective doses of Beta Alanine, Citrulline Malate and Creatine we can say that there is probably not enough of any of these substances in there. 3.7g of each substance alone would only just be enough but to include both of them in the 3.7g means they must be under dosed, though there are other factors to take into account which we will examine below. As stated above, there is only really a sprinkling of the fundamental ingredients included in pretty much every pre workout product. The ‘big 3’ of pre workouts – Beta Alanine, Creatine and Citrulline Malate (or some other N.O. booster) are all included however it seems that their inclusion is a token gesture as the doses are rather low. All of these substances are delivered in very effective forms (eg. Beta Alanine as CarnoSyn) however they are probably still too low for most people. For example, 1.5 grams each of CarnoSyn and Citrulline Malate would be just sufficient but if the total dose is 3.713g and 3g is made up of the above that only leaves 0.7 grams for Creatine which is nowhere near the recommended dose for maximum effectiveness of 3-5 grams. Some of the other ingredients give rise to synergistic effects when combined with the big 3 but it is not really enough for me to get excited over. For my mind, this is where this product really excels. 2 of the 3 patented ingredients are found here and though the amounts are not listed, they really seem to work well so the assumption is that they are in significant quantities. 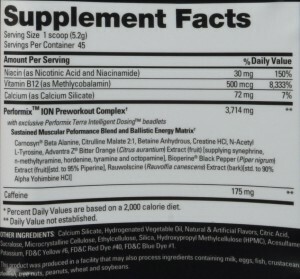 I think that this component of the product alone makes it worthwhile and frankly there are not many pre workouts that provide adequate maintenance doses of the big 3 anyway so many people (myself included) supplement the big 3 separately and only use the pre workout for the stimulant component anyway. 2 products I recommend for the big 3 are Bullnox (or B-Nox now) Androrush by Betancourt Nutrition and Opus by Magnum Nutraceuticals. Anyhow, back to the stims. N-Acetyl L-Tyrosine is a substance many people like due to the boost in focus it delivers. I get distracted easily and sometimes find it hard to stick to my program at the gym so for me this is a must in an pre workout. Many people report great focus from this product so the dose must be right. Next is Advantra Z, which is a patented form of bitter orange extract known to be a highly effective nootropic mood enhancer and stimulant, especially when combined with caffeine. (If you don’t like caffeine, check out these caffeine free pre workouts.) This is great as I find being in a good mood really helps with working out, and pushing myself to the limit. Thermogenics (fat burners) are very popular now, with the focus these days tending more towards a ripped body rather than a big body. The last 2 parts of the formula (Bioperine and Yohimbe) are basically this. On their own these substances can be powerful but the synergistic effects of combining these ingredients is said to make them far more effective and anecdotal evidence indicates that this is indeed the case. For me, this is the feature that really makes this product stand out from the crowd. The technology here is nothing new (think slow release fertilizer) but its application to pre workout supplements is cutting edge. With many products, the nature of the stimulants and nootropics used means that the effects are short lived. By delaying the release and subsequently absorption into the bloodstream of these components the Terra beads can make for a smoother transition into beast mode and also prolong the effects. This can help you both work out longer, soften the crash and also get more from your workout regime. I think this product would be great for someone who wants long lasting energy and focus. I rate it 8/10. 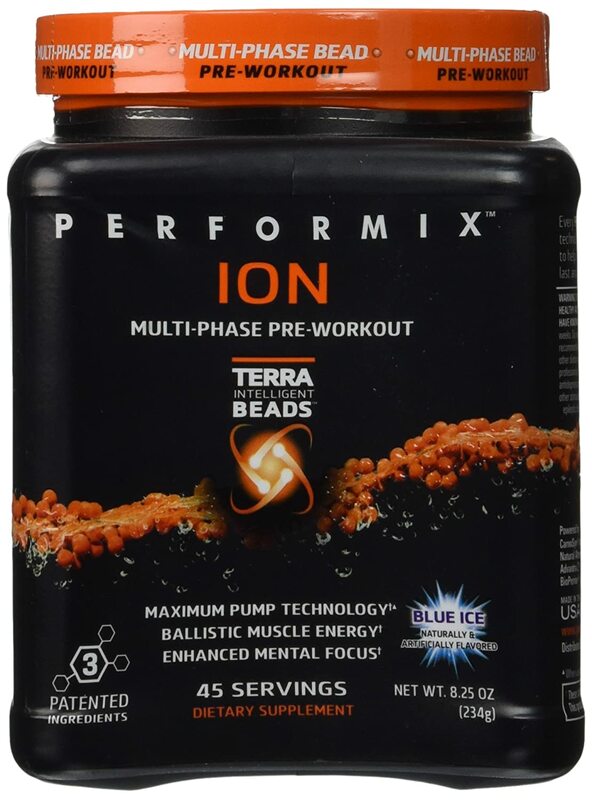 I have been looking for a good preworkout supplement for a while now and had never heard of Performix Ion before. Most perworkouts that I have used before have a very quick effect, but usually end with a crash soon after. I’m interested in trying Performix Ion because it seems to last longer than the other mixes. I’ll let you know the results. Thanks Alex, I think you will get a lot out of the ION pre workout. Can’t wait to hear how you go! Workout supplements is such a competitive market anymore. Performix ION seems to be on to something big with breaking through and providing longer results. I hate nothing more during my workout than being pumped up and crashing before my workout is over. It sounds like this may be what I need to get me over the hump. Thanks for your information. Performix ION Pre Workout sounds like it has a perfect blend of ingredients. Each ingredient will certainly help improve workouts in the gym. I especially like that it contains N-Acetyl L-Tyrosine. I could see that really helping me out during my workouts. The terra beads are also a great addition. They make this preworkout stand above the others as it can last way longer. All of these things sound perfect to me. Thanks for the awesome review, now I know what to get my brother for his birthday! thanks Christina, I’m sure he’ll love it!